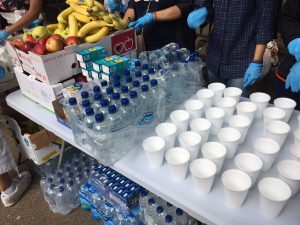 Fresh fruit, water and hot drinks are among the items distributed every Sunday at Children of Adam. Children of Adam – the outdoor soup kitchen feeding London’s most vulnerable. The rising cost of living is forcing many of the most vulnerable onto the streets of London and the struggles are only getting harder by the day. Last year alone, more than 8,000 people slept rough on London’s streets. Over the years, Children of Adam transformed through fundraising and the kind donations of the community. Now in our 8th year, we serve hot food, snacks and drinks to 170 guests every week. It’s a simple process, a free hot meal, a free cup of coffee, a place to see familiar faces and have people ask how your week has been… A smile and a sandwich costs us nothing as volunteers but it can mean the world to someone who is down on their luck. It’s the least we can do for one another. I chose the name the Children of Adam partly to honour the memory of my younger brother Adam who passed away when he was just 25 years old and partly to remind us that, in the grand scheme of things, we are all Children of Adam (and Eve). Regardless of race, gender, religion… we are all part of the same family, humanity, and we need to practice a little more humanity with each other, even just by sharing a hot cup of soup on a rainy day.